Hope you had a wonderful Thanksgiving! A reminder a Stream and Brook gift certificate makes an excellent Christmas present! There is a little snow on the ground in Middlebury but it should be in the 40’s the next few afternoons with some sunshine. 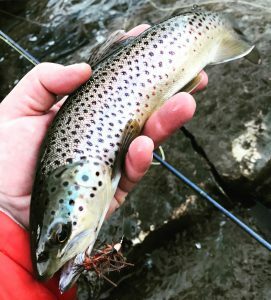 Decent weather for fly fishing. In the mountains there is quite a bit of snow! 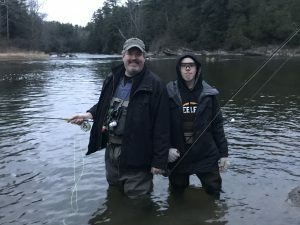 Lots of folks are thinking about skiing and snowboarding we are as well but we also love Winter fly fishing in VT. 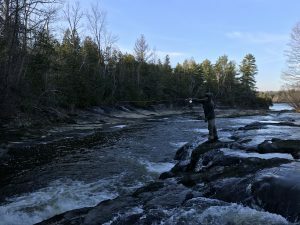 The Otter Creek is currently at 576 cfs and has great clarity. We have been finding some nice fish stacked up under its many waterfalls/ dams. This is one from Sunday evening South of Middlebury. 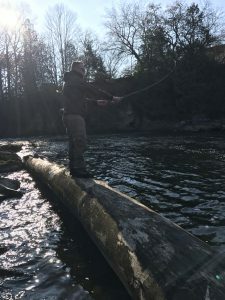 I like this time of year as the local rivers has very low fishing pressure and even though it’s cold if you dress properly it’s not to bad. 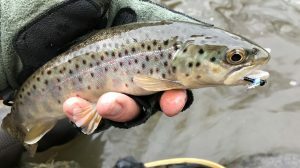 The fish certainly eat all Winter so if you keep putting flies in the right areas you will catch some great looking fish. The weekend before we had out a father and son. They both caught fish and had a blast. John left a very nice testimonial on our last post about gift certificates. Read it below. 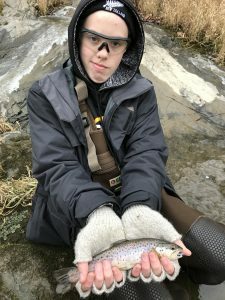 “Took my 12-year-old, complete newbie to fly fishing outing with Brian C this weekend, and had an absolute blast! Brian has the patience of a saint and a great personality to match his skill and knowledge on the water. 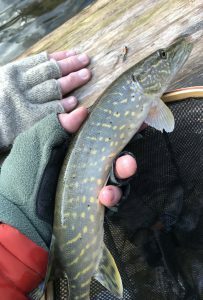 We (surprisingly, counting the pike) caught 3 species of fish, including my young lad’s beautiful brown trout. The more I think about the trip, the good time we had then PLUS the tips, tricks and encouragement and direction to come back and try it ourselves in the future, the happier I am. That is really cool! My son and grandson making wonderful memories together. !